This time round, I would take a break from Feng Shui into Bazi. I would like to briefly discuss a chapter from this book I read some time back and I also did a review on it on my blog. You can check out the Book Review Category. Why I choose this is particular subject is because I believe it is thought provoking. Many of us who has studied Bazi, will know that Wealth star does represent wife as well as wealth or simply said money star. In Chapter One, there is this person called Xavier Cugat and attached below is his Bazi. 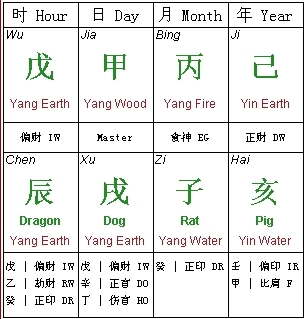 Xavier is a Jia Day Master born in the season of Zi. You can see that his wealth, represented by the Earth element is abundant inside his chart. In reality according to the author, he has lots of wife, in fact five, was a womanizer but he did not do well financially. How do you tell when Wealth element means money or women or both ?